Inflatable Joust Interactive – When we're young, our imaginations are endless. For every film we watch, story we read, and wild tale we hear about, we picture what it's like to live within those imaginary landscapes. When you were young, did you ever imagine what it would be like to be a knight in shining armor – and joust about? 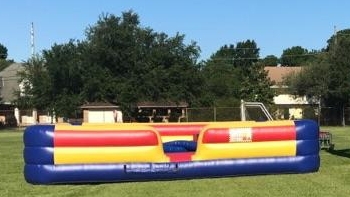 Well, now, would be About to Bounce Inflatable Joust Interactive, you can give your party guests at any children's birthday, or any other event, the experience of jousting in a safe environment. 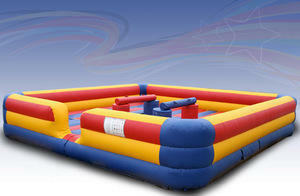 The Inflatable Joust Interactive arena is large enough for four people to participate at once, with safety boundaries that will keep guests from falling. Ignite the imagination within every guest, as you empower them to become the Knights they have always wanted to be. Priced at $269.99 for a five hour rental, this is a call back to the Renaissance, without the cost of having to build a time machine.